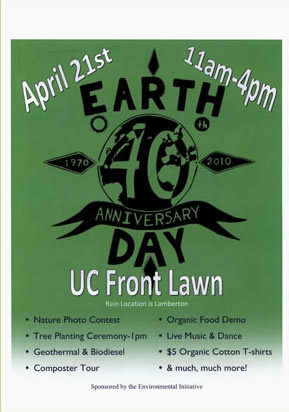 40th Anniversary of Earth Day at Lehigh, sponsored by the Environmental Initiative. "The Environmental Initiative (EI) is an interdisciplinary program of academics, research, and outreach whose overall mission is to advance humanity's understanding and awareness of our role in and interaction with our natural environment through research, teaching, and outreach. The EI enables interdisciplinary efforts that transcend typical departmental and college boundaries in degree programs, problem-based research projects, and environmental education for school children, policy-makers, and the general public. The EI consists of faculty, staff and students from all four college of Lehigh, including two core departments, Earth & Environmental Sciences (EES), and Civil & Environmental Engineering (CEE)." Environmental Initiative staff and faculty have sponsored Earth Day celebrations on campus, and promoted environmental literacy in local schools. They have worked to create curriculum spanning multiple disciplines, and encourage collaboration across Lehigh's campus.